Featuring 20Gbps Thunderbolt 2 technology that provides sufficient bandwidth to support many of the highest performance and most demanding PCIe cards, the Echo Express SEL delivers maximum performance when connected to a computer with Thunderbolt 2. The SEL is also fully compatible with computers with 10Gbps Thunderbolt technology, supporting most cards at full-performance. Today's ultra-light notebooks, mini, and all-in-one desktop computers now have tremendous processing power—power that many thought would only be possible in full-size workstation or large desktop computers. Smaller in size and more portable, they're very desirable. For pros in the creative fields, processing power alone is not enough. A prime example is the new Mac Pro®. Reviewers love its performance, but make a point of mentioning its lack of internal expansion capabilities compared to the old towers the new model replaces. If you want to add more capabilities, think external—the new Pro is loaded with Thunderbolt 2 and USB 3.0 ports, but it lacks the PCIe expansion slots necessary for you to install specialty high bandwidth NIC cards, or HBAs and RAID controller cards for high-performance storage. 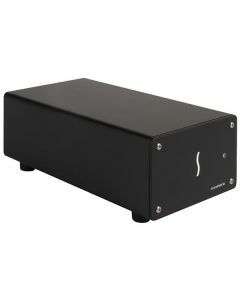 With the Echo Express SEL, Sonnet has created a solution that leverages the paradigm shift enabled by Thunderbolt technology, allowing PCIe expansion slots to be connected outside a computer. This very compact desktop Thunderbolt 2-to-PCIe card expansion chassis is ideal for connecting one professional 16Gb or 8Gb Fibre Channel, 10 Gigabit Ethernet, SAS/SATA host bus adapter or RAID controller PCIe card to any Mac® with a Thunderbolt port.